The Mayor of Slamtown was just voted out of office, and quite abruptly! I’m going to dissect what went down during tonight’s amaze-balls episode. First, I want to reassure all of you that you’re not crazy. You didn’t miss anything last week. Some scheduling issues (I was in Vegas!) prevented me from posting a written recap last week. It warmed my big ole heart that I heard from many of you, things like, “where is the Recap?” and “are you OK?” Well rest assured I’m fine (down a few bucks from Vegas, but whatever). I did post a FilmSurvivor Podcast last week with my exclusive exit interview with Elizabeth. So if you did miss that it’s still available for you to give a listen. But we have to begin with the end, of this week’s episode that is. 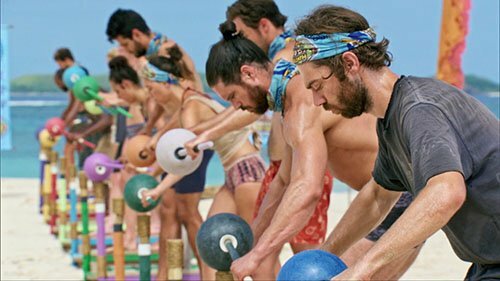 I know I say this every so often, but wow do I love this show…episodes like tonight – definitively and unarguably the best episode of the season – continue to pound home the fact that Survivor is the greatest reality show of all-time…then, now, and as long as we keep getting casts like this, forever more. Pro Wrestler John Hennigan never saw this one coming, nor did the audience, and just like that the largest Goliath of them all took the fall. It was a “Brochacho Blindside,” a term that John himself threw out there this week. He of course was referring to what he thought would be the blindside of Christian, and it very well could have been. So instead of everyone’s favorite player getting sent home (Christian), John was sent to jury (perhaps the second-most beloved player out there?) and the trajectory of this game continues to spin in unforeseen, exhilarating directions. And while we may still be waiting for Alison to get the screen time she deserves, we finally got us some Davie! Man, was it worth the wait. Basically if we start to hear from him in a given episode, we know something big is about to happen, or at least that’s how it feels. He pops up earlier in the season and finds an Idol, and then vanishes from our screens for the most part. He was barely even present during last week’s merge episode, an ep that is usually one of the biggest of the season. But holy crap did he affect tonight’s episode. Is Davie on pace to win this thing? 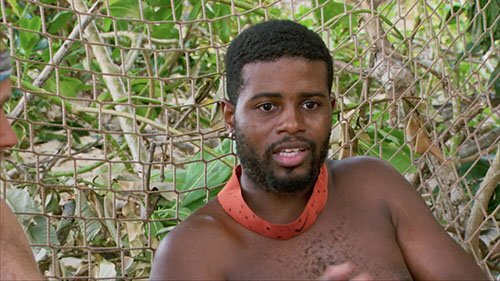 Is that Survivor: Ghost Island winner Wendell Holland‘s toothpick that Davie has, and if so, is it magical or something? Some sort of blessed Immunity Idol that even Jeff Probst is not aware of? Davie started the episode doing some taekwondo on the rocks as a diversion, but by the end he was landing lethal blows “off the top rope,” taking down the biggest, baddest Goliath of them all. He managed to do so by doing something that EVERY player talks about doing but usually is unable to: He kept the knowledge of his hidden Idol to himself until the very last moment when it needed to be revealed. It sounds so simple, yet few, if any, ever pull it off. Like kudos to Davie, for real. It’s still early, but his move tonight and the way he managed this Tribal Council feels to me like one of the very best moves the game has ever seen at a Tribal. It goes from a great move to a legendary move if this propels Davie to the end of the game, and a win. But even if Davie goes home next week, this Tribal will go down in history as one of the best, and one of the biggest blindsides of all-time. Right? I mean, even going into Tribal, if you would have listed all of the potential people that could go home, John would have been dead last, right behind Dan, who was Idol-safe, no? 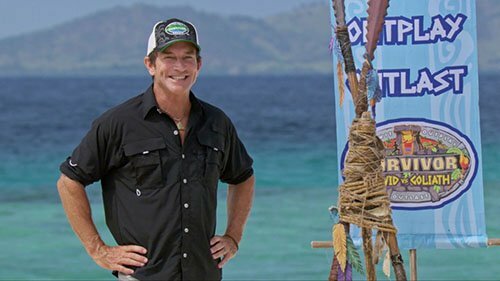 Here was a guy on the minority alliance, who was able to keep an Idol a secret for several weeks, who managed not only to flip the result of a Tribal Council away from the majority, but who then was able to handpick for himself the person he really wanted out. I mean simply put: It doesn’t get much better than what Davie did tonight. 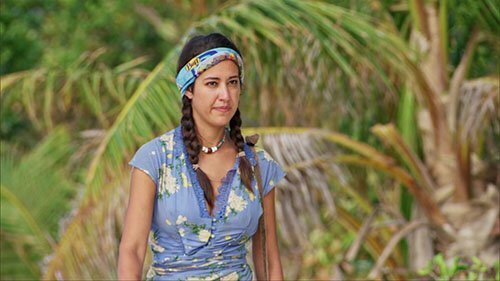 The great cast, and high level of intellect on the island this season is stunning, and I am now rooting for more and more strategic maneuvering. Forget David vs. Goliath, how about Mike versus Christian the rest of the way out, the Battle of the Brains? On the surface, Christian looked like a sitting duck tonight, and he was. And yes, Davie saved his game with an Idol. But don’t call Christian helpless. You have to look at a person’s entire game, their social, strategic and physical game, and all that has led up to the moment. The reason Davie saved Christian tonight was not just because of Davie, it was because of Christian. Christian’s social game being as stellar as it is, earned him this chance to stay in the game past this point, because the relationships he developed from Day One put him in a position where his friends were willing to give up their game advantages in order to keep him around. That’s huge. So don’t think that Christian was in a position of weakness. He was vulnerable tonight, yes, but weak? Hell no. Davie‘s move – made collectively with Nick and Christian it appears, as they all voted for John – makes this season astronomically more interesting. We are not headed towards a stretch of predictable episodes, that’s for sure. The Survivor dominoes fell quite brilliantly tonight, which is endlessly fascinating to me. 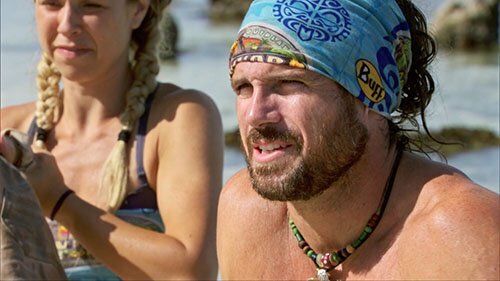 It all started with last week’s Tribal, where Gabby apparently gave Mike some hesitation to move forward with the “Strike Force” alliance. Gabby’s behavior of course came in response to Angelina‘s decision to try to “jury manage” Elizabeth, and so on and so forth…you could keep going back. But once Mike had hesitation about Gabby, it realigned his thinking. The next domino was to target the biggest David threat, whom he perceived to be Christian. That led to the explosive Tribal Council we just witnessed, and John‘s departure. These actions will lead to other big and small events. And the dominoes will continue to fall, and fall, and fall. Not lost in all of this was that Dan decided to use one of his two Idols on Angelina, this season’s only clear-cut “villain.” This move contradicted what he had told Alec earlier in the episode. Dan doesn’t know it yet, but this decision could be the first nail in his coffin. Now he has just one Idol in his possession and with the Goliath’s still in a 6-5 majority. Dan doesn’t know that the Davids possess not only an Idol Nullifyer, but now a “steal a vote” advantage. If used properly, this could put the Davids in the majority as early as next episode! Episode Take-Away: I’m loving this season more and more, and the cast continues to impress. A Davie-centric episode was well worth the wait. 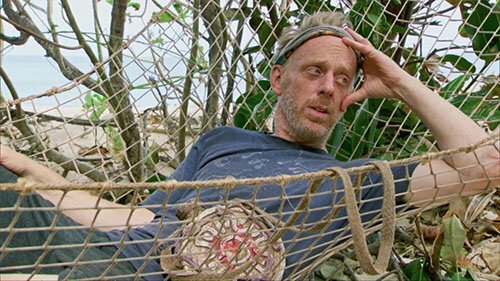 No matter what happens from here, tonight’s episode will be the pivotal one that everybody is looking back at after the Sole Survivor has been announced. There is one thing that is a little bit sad. The way things went during this episode really galvanized the remaining players back in their David vs. Goliath original tribes. Heading into this episode, there were many other possibilities of cross-overs or people working across the proverbial aisle. Not anymore. The Goliaths will now need to stick together more than ever. Players like Mike just lost every chance they had to work silently with the other side. Yes after eight episodes in, this season is very much still David vs. Goliath. If tonight’s Tribal is any indication, the Goliath’s are going to need to come up with a much better defense against their foe’s sneaky slingshot. On a completely random side note, I must also add that tonight’s challenges were great as well. Simple, yet suspenseful, both of which required immense concentration and focus. And you know they’re pretty good challenges if I even mention them at all. Those that read this column regularly know that I rarely, if ever, even mention the challenges! Next Week’s Episode: Apparently Kara and Dan break up? And right before Thanksgiving! Quick Note! I appreciate that you are reading this Recap! But all season long, remember to return right here to Reality Tea for my FilmSurvivor Podcast on Thursday, where you can listen to my full exit interview with the eliminated contestant. This week I will be chatting exclusively with John Hennigan. Those that have followed me also know that I am a RottenTomatoes-approved film critic, and I encourage you to check out my weekly movie reviews (like “Fantastic Beasts 2,” and “A Private War” this week) as I am also the national film critic for AXS.com and am a movie critic/TV personality in the Detroit area. As always, the easiest way to get all of my Survivor coverage and movie reviews is to follow me on Twitter – @tomsantilli – or on Facebook. TELL US – WHAT DID YOU THINK OF TONIGHT’S EPISODE? DAVIE WAS UNDER THE RADAR, IS HE NOW THE GOLIATH’S TOP TARGET? AND DID YOU SCREAM WHEN ANGELINA WAS SAVED?